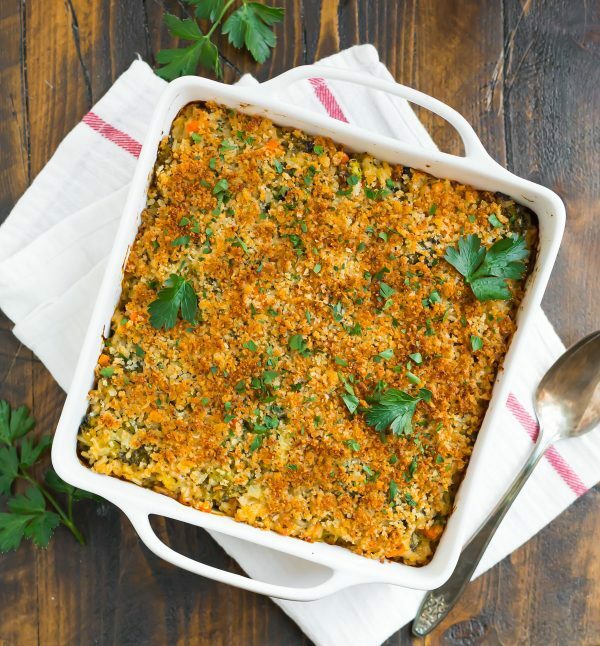 I have a pan of comfort food for you today in the form of Broccoli Rice Casserole. It’s a fully loaded nine square inches of all the best parts of an old-school casserole—the creamy, cheesy inside, the grandma (in a good way) mix of veggies and rice, and the irresistibly buttery, crispy topping—and exactly none of the worst parts. This broccoli rice casserole is made from scratch with ingredients you can feel good about, and its family-friendly flavor will be a hit with kiddos and grown-ups alike. This recipe is sponsored by Land O’Lakes. Courtesy of a midwestern upbringing peppered with a large family collection of what I can only describe as “church lady” cookbooks, I consider myself a steady casserole connoisseur. Dishes like southern broccoli cheese rice casserole were a staple at our childhood dinners, but when I started cooking for myself, I avoided them at first. I associated casseroles with processed ingredients. When you step away from the stereotypes, however, casseroles have incredible meal potential. They offer many rich food groups in one pan, can scale to feed a crowd, and are freezer friendly too. 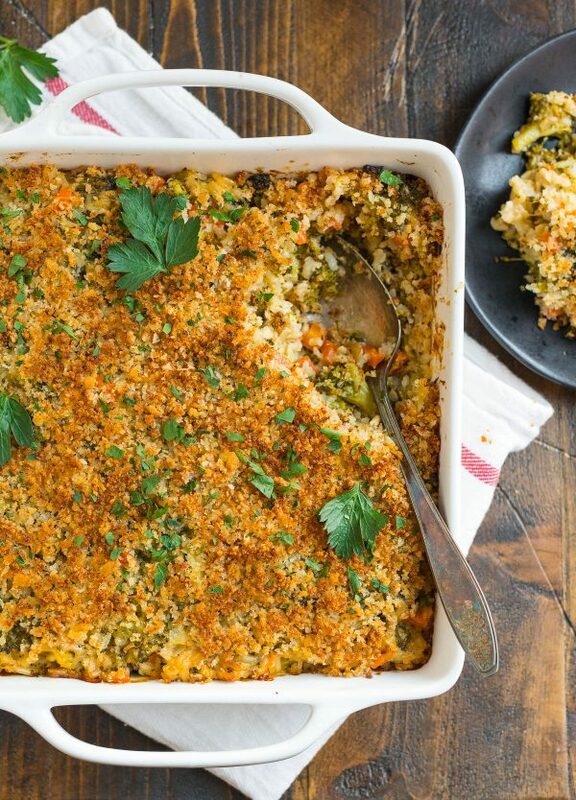 *Cue the superhero music* It’s time for this Broccoli Rice Casserole to shine! 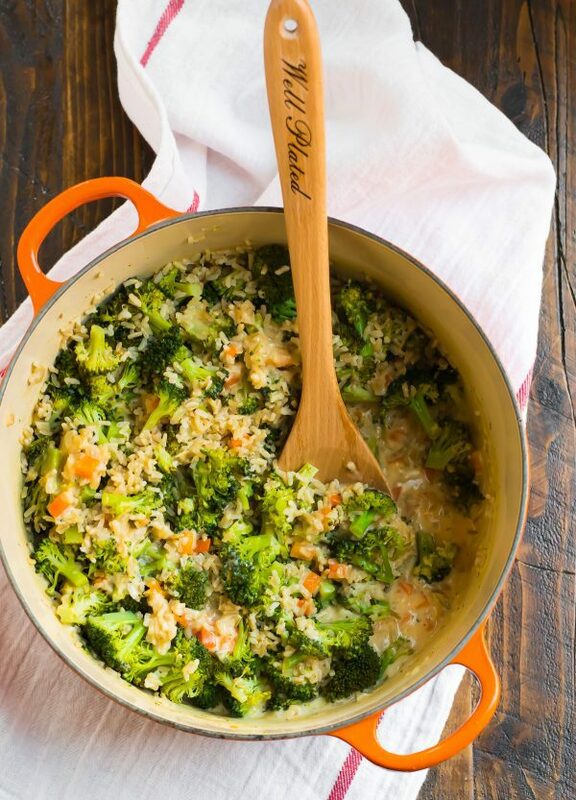 This modern take on the midwestern and southern favorite is made with fresh vegetables like broccoli and carrots and offers whole grains thanks to brown rice, and the luscious, velvety sauce is made with cheese and Greek yogurt. This Broccoli Rice Casserole is Sunday nostalgia meets weeknight practical. The next time you need a filling side for dinner, a family gathering, or even a holiday, this Broccoli Rice Casserole will save the day. Don’t Skip the Good Stuff. 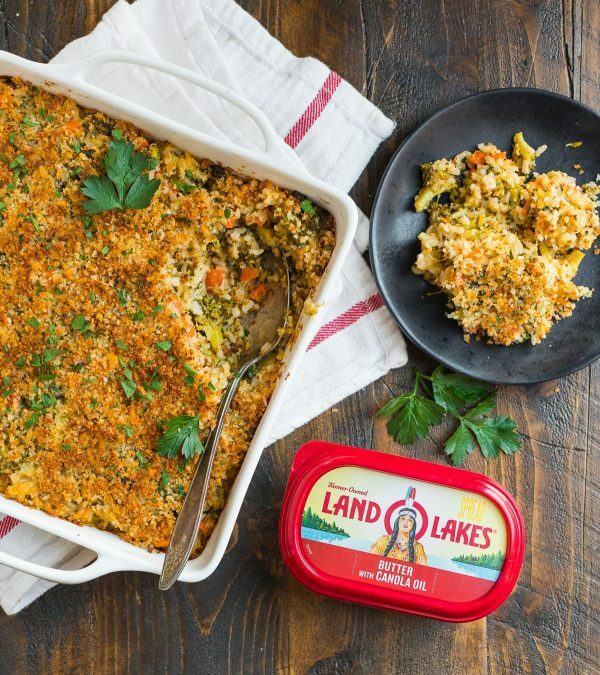 The casserole does need some richness, which is why I opted for Land O Lakes® Butter with Canola Oil. It’s made with only sweet cream, canola oil, and salt, has a fresh buttery taste, and is ultra-convenient. We always have a container in our refrigerator. I love that I don’t need to wait for it to soften or cut into a fresh stick of butter when I only need a few tablespoons. I used the Butter with Canola Oil both in the cream sauce to give it a wonderful, lightly indulgent flavor and in that signature breadcrumb topping for a golden crunch. Choose the Right Cheese. I opted for freshly grated sharp cheddar, which melts beautifully. I prefer sharp cheddar because it is more fully flavored, and thus a lesser amount goes a long way. Use Brown Rice. It’s higher in nutrients and fiber than its white rice counterpart. For this casserole, I opted for instant brown rice, which cuts nearly 40 minutes out of the cook time. It also saves a dish, since the rice and broccoli can steam together in the same pot. Go for Greek Yogurt. A fantastic ingredient to make creamy casserole sauces, it’s high in protein and low-calorie. Breadcrumb Topping. Is it actually a casserole without the topping? Let’s discuss over our second helpings. 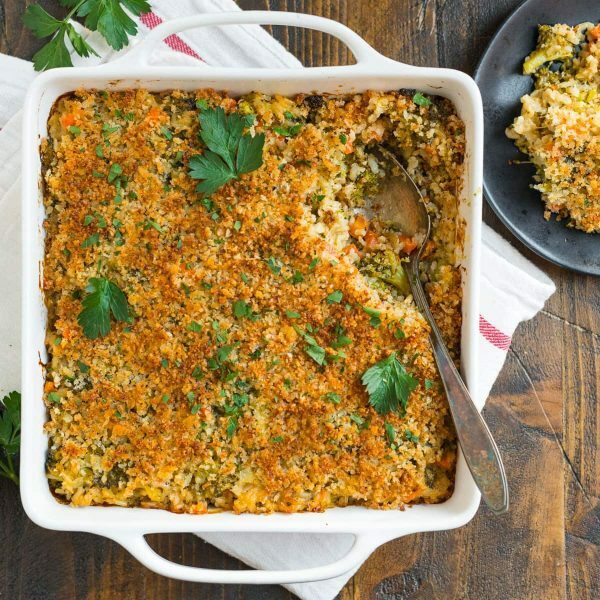 This easy Broccoli Rice Casserole bridges the divide between the food we “want” to eat—food that fills, is comforting, and is both sentimental and scrumptious—with the food we “should” eat: balanced, wholesome recipes made with ingredients we feel can good about. Easy Broccoli Rice Casserole! Cheesy and creamy like the original, but lightened up with everyday ingredients. A favorite dinner or potluck side. Place a rack in the center of your oven and preheat the oven to 375 degrees F. Lightly grease a deep 9-inch-square baking dish or similar 2 1/2-quart casserole dish. Bring the broth to a boil in a large pot, then add the rice. Return to a boil, add the broccoli to the top of the rice (no need to stir it together), then cover, reduce the heat to low, and let cook 5 minutes. Remove the pot from the heat and let sit, covered, for an additional 5 minutes. Most of the rice liquid should be absorbed. Meanwhile, in a dutch oven or other large deep pot over medium heat, heat 2 tablespoons Land O Lakes® Butter with Canola Oil. As soon as it melts, add the onion, carrot, 1/2 teaspoon salt, 1/2 teaspoon garlic powder, and 1/4 teaspoon black pepper. Sauté until the onion is soft and starting to brown, about 4 to 6 minutes. Grab a whisk and keep it handy. Sprinkle the flour over the vegetables and cook, stirring with a wooden spoon or a spatula, until all of the white parts of the flour disappear. Splash the milk into the pot a little at a time, whisking to keep the sauce smooth. Once all the milk is added, stir constantly and cook until thickened, about 7 to 10 minutes. Remove from the heat and whisk in the Dijon and remaining 1/4 teaspoon salt, 1/4 teaspoon garlic powder, and 1/4 teaspoon black pepper. Let cool slightly, then stir in the Greek yogurt and cheddar cheese until smooth. With a large spoon, scoop the rice and broccoli into the pot with the cheese mixture. Stir to combine the rice and broccoli with the creamy sauce. Spoon the mixture into the prepared baking dish and spread it into an even layer. 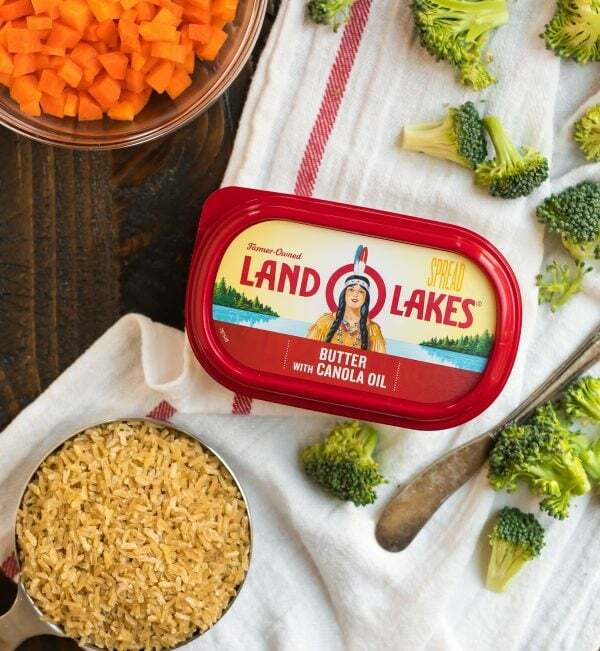 In a medium microwave-safe bowl, melt the remaining 2 tablespoons Land O Lakes® Butter with Canola Oil. Add the panko and Parmesan and stir to combine. Sprinkle the topping over the casserole. Cover the casserole (with the lid or foil if it doesn’t have an oven-safe lid) and bake for 15 minutes, then uncover and continue baking until hot and bubbly and the panko is toasted, about 15 to 20 additional minutes. Let stand 10 minutes, then serve. Refrigerate leftovers for up to 4 days or freeze for up to 3 months. Reheat gently in the microwave or in the casserole dish in a 350 degree F oven. If using the oven, loosely tent the casserole pan with foil and place the pan on the center rack for 15 to 25 minutes, until warmed through (the larger the serving, the longer you will need). The brown rice really shines here! That is an awesome way to serve broccoli rice Erin!! This sounds delicious and healthy as well. Will definitely be making this! Thanks for your recipe. I hope you love it, Peggy! I hope you love it, Sam!